Since CEIR-17, three natural gas generation facilities have been permitted in Maryland. In addition, Maryland’s Renewable Portfolio Standard (RPS) has stimulated a large number of proposals for solar photovoltaic (PV) facilities, particularly on the Eastern Shore and in mid-Maryland. While producing both environmental and economic benefits, the licensing of these facilities has required PPRP to consider socioeconomic impacts in its environmental reviews unique either to the generation technology or its location. Two projects that have recently received CPCNs to construct and operate natural gas-fired generation plants in Prince George’s County illustrate the uniqueness of land use issues that arose from their location. Located near Brandywine in southern Prince George’s County, both the Keys Energy Center (KEC) and Mattawoman Energy Center (MEC) were sited in an area of concern to Joint Base Andrews (JBA) (formerly Andrews Air Force Base). 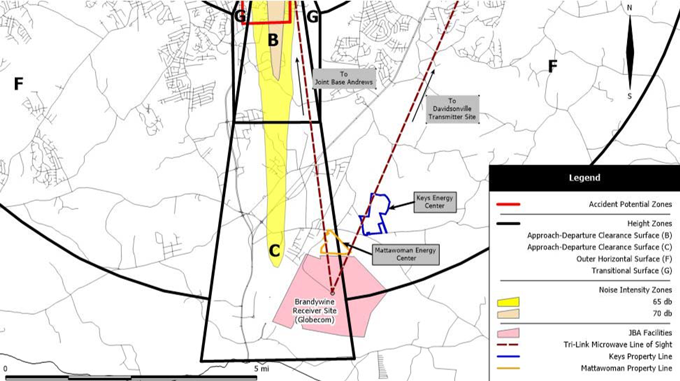 The projects are also directly north of the Globecom Receiver Site, one part of the Andrews Tri-Link, a secure communications facility linking JBA and the Davidsonville Transmitter Site (see Figure 4-26). With continuing population growth in Prince George’s County, suburban encroachment upon these important military facilities has for years been of concern to the United States Air Force (USAF), prompting the Joint Base Andrews Naval Air Facility Washington Joint Land Use Study (JLUS). The study’s outcome resulted in recommendations for promoting compatible land use policies around the facility and, in 2012 Prince George’s County implemented an Interim Land Use Code (ILUC). The code governs development in areas impacted by height limitations, high noise levels, and high accident potential resulting from flight patterns at JBA for an interim period while long term regulations are being developed. ILUCs were established to prevent the intensification of existing land uses while the Military Installation Overlay Zone (MIOZ) is being developed as proposed in the JLUS and supported by recommendations in the Air Installation Compatibility Use Zone Study. The KEC property is within the Outer Horizontal Surface zone (Zone F), one of six height zones around JBA. The Outer Horizontal Surface is defined as an imaginary surface located 500 feet above the established airfield elevation, and extends outward from the outer periphery of the conical surface (Zone E) for a horizontal distance of 30,000 feet. Part of the MEC property is also within the JBA Outer Horizontal Surface zone, with the rest within the Approach-Departure Clearance Surface (Zone C). The Approach-Departure Clearance Surface is symmetrically centered on the extended runway centerline, beginning as an inclined plane (glide angle) 200 feet beyond each end of the primary surface, and extending for 50,000 feet. The slope of the Approach-Departure Clearance Surface is 50:1 until it reaches an elevation of 500 feet above the established airfield elevation. It then continues horizontally at this elevation to its termination. Prince George’s County passed legislation in 2012 including a zoning bill (CB-3-2012) that established boundaries of the ILUC area and controls for uses closest to JBA, and a subdivision bill (CB-4-2012) to bring development rules into the subdivision ordinance. County ILUC regulations, for example, forbid the issuance of building permits for any structure exceeding the height of any imaginary surface. The tallest structures (combustion turbine stacks) of the KEC were initially proposed to be 175 feet above ground level (AGL), while those of the MEC (two combustion turbine stacks and the auxiliary boiler stack) were designed to be 100 feet AGL. After analyzing the locations of the structures relative to JBA’s imaginary surfaces, PPRP was able to conclude the projects appeared to be compatible with the county’s ILUC regulations. Click to OpenEvaluating Noise ImpactsHowever, the USAF was also concerned with microwave and high frequency communications interference, radio frequency interference with the Andrews Tri-Link, and potentially other conflicts that could impact missions affecting national security. Aircrews from JBA also use four landing zones at the Globecom Receiver Site to practice unimproved landing area operations and helicopter flight patterns overfly the Mattawoman site. In response to Keys’ filing of a Notice of Proposed Construction or Alteration for the KEC, the FAA issued a Notice of Presumed Hazard. In particular, the Federal Aviation Administration (FAA) found that at the filed height (175’) and location, the stacks would exceed obstruction standards or have an adverse physical or electromagnetic interference effect upon navigable airspace by blocking the JBA terminal Doppler weather radar low elevation scans. FAA’s notice also indicated that if the stacks were reduced to a height no more than 141 feet AGL they would not exceed obstruction standards, and a favorable determination could be issued. Keys modified facility plans by reducing stack heights to 140 feet AGL and subsequently entered into a stipulated agreement with JBA to address remaining concerns. A similar agreement, which included a clause retaining JBA’s rights to continue helicopter operations over the generating station, was later executed between Mattawoman and JBA. PPRP’s consultation with JBA in both licensing cases was an important catalyst for the resolution of these issues. Solar photovoltaic (PV) generation facilities are land intensive. As a rule of thumb, a solar PV facility consumes 5-10 acres per MW capacity, depending upon the strength of the solar resource and other factors. With ever-increasing efficiencies in solar panel technology, the density is approximately 5 acres per MW currently. Since most existing and proposed solar facilities are sited on agricultural land, decommissioning has been an ongoing concern in PPRP’s environmental reviews of these projects. There are no nationwide or statewide standards for decommissioning at present. However, restoration of a site to its “original state” would appear to be a reasonable goal of a decommissioning plan. A model bylaw developed by the Massachusetts Executive Office of Environmental Affairs defines restoration as the physical removal of all large-scale ground-mounted solar photovoltaic installations, structures, equipment, security barriers and transmission lines from the site; disposal of all solid and hazardous waste in accordance with local, state, and federal waste disposal regulations; and stabilization or re-vegetation of the site. Physical removal of ground-mounted structures includes the removal of all or some of below-ground foundations and supports, although the landowner or operator may leave designated below-grade foundations in order to minimize erosion and disruption to vegetation. Particularly for agricultural land, the abandonment of below ground structures is a concern. A review of decommissioning plans of proposed or existing solar facilities in North America revealed no consensus with respect to below-ground structures, with decommissioning ranging from complete removal without exception to removal to a depth of between two and four feet below grade. 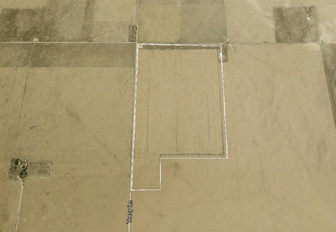 PPRP interprets restoration of a site previously used for agriculture to an “original state” to mean being returned to an agriculturally productive state which allows for safe agricultural practices. 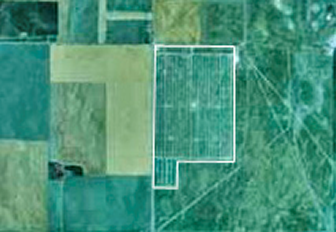 With soil compaction being a recurring problem in agriculture, and the potential for deep tillage applications on decommissioned solar farms to restore the land to agricultural use, PPRP recommends removal of below ground structures and cabling to a depth of at least three feet in project decommissioning plans. Another concern is whether land converted from agriculture to solar generating facilities will actually be returned to agriculture after the facility reaches the end of its useful life. Clearly, a viable option for solar generators is to refit the facilities with new solar panels, given the existing infrastructure in place to support solar generation (cabling, supports, inverters, etc.) and both increased efficiencies and declining prices for PV panels. If solar PV generation is not overtaken by another technology but instead continues to contribute to Maryland’s generation capacity, it could be a very long time before the land is returned to agriculture or converted to another use. Given the relative youth of most renewable energy technologies, there are only a few decommissioning examples, of which many are hydroelectric dams. However, the decommissioned Carrisa Plains (also known as Carrizo Plains) photovoltaic power plant is an interesting story. 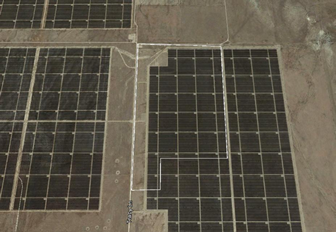 Constructed by ARCO Solar between 1983 and 1985 in central California, Carrisa Plains was then the largest photovoltaic array in the world, with 100,000 1' x 4' photovoltaic arrays producing 5.2 MWac at its peak. The facility occupied about 177 acres in San Luis Obispo County near San Bernardino. It followed ARCO’s construction of the Lugo plant, a 1 MW pilot operation in Hesperia, California. Neither facility was able to compete with fossil fuel-based generation, and ARCO sold them to the Carrizo Solar Company for $2 million in 1990. However, by that time the Carrisa Plains plant was producing less than 3 MW of its original 5.2 MW rating, and was decommissioned shortly thereafter. The Carrizo Solar Company dismantled the facility in the late 1990s and the used panels were resold, some of which were subsequently used in domestic installations. The site was then stripped clean of structures and other electrical components, re-graded and returned to dry farming (Figure 4-27). Information about the extent to which the project site was restored to its former use is limited. State documentation indicates a cleanup of contaminated soils, and the site is reported to have had an underground storage tank containing diesel fuel, although no violations were reported. 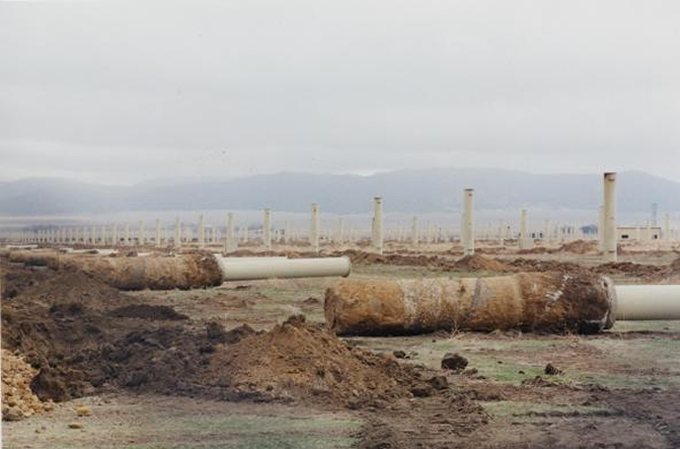 In 2009, it was unknown whether the underground storage tank was still present. The story does not end there, however. The site is now part of First Solar’s 550 MW Topaz Solar Farm, constructed between 2011 and 2014, and occupying 9.5 square miles. That the site is hosting another solar PV facility should not be a surprise. Carrizo Plains is one of the sunniest places in California. Ironically, as part of a settlement with environmental groups, First Solar has committed to cease operations after 35 years (2047) and restore the area to its natural state, placing a conservation easement on the land and providing an endowment for managing the land in perpetuity. 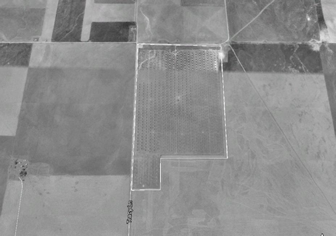 Figure 4-28 shows the site’s land use transition from solar PV facility to dry farming to the Topaz Solar Farm. Solar panels and associated electrical equipment are largely free of flammable materials. Although potential health hazards have been associated with toxic materials released during fires from cadmium telluride, copper indium diselenide and gallium arsenide photovoltaic modules, crystalline solar cells used in Maryland installations, which are primarily made of silicon, are not considered to be hazardous to the environment. Still, respiratory exposure to combustion products associated with PV components should be avoided. With respect to other components, some modern transformers use mineral oil as a coolant while others use dry-type cooling. The flashpoint of mineral oil is 335°F, significantly higher than the U.S. Occupational Safety and Health Administration (OSHA) standard, which defines a flammable liquid as any liquid having a flashpoint at or below 199.4 °F. Post-construction, the risk of fire from ground-mounted photovoltaic systems is low if site preparation and maintenance has minimized potential fuels from under and around solar arrays. Fire prevention guidance for ground-mounted PV installations is contained within the National Fire Protection Association’s NFPA 1 Fire Code Handbook and NFPA 70 National Electrical Code. PPRP’s recommended license conditions for solar PV projects require developers to design, install and maintain the facility to meet the minimum standards set forth in NFPA 1 and NFPA 70. Although the likelihood of fire is low, a challenge facing firefighters during fireground operations at PV facilities is the risk of electrical shock. This is because PV panels generate electricity when exposed to sunlight. Even at night, apparatus-mounted scene lighting may produce enough light to generate an electrical hazard. Under a continuous electrical load, any conduit or components between PV modules and disconnect switches will remain energized. Inverters may also provide voltage during daylight hours for several minutes on both sides of a disconnect, even when opened. The Fire Protection Research Foundation also recommends the use of respiratory protection during fireground operations involving PV systems. While guidelines for fire operations at PV facilities have been published, PPRP is aware that most fire and rescue companies in rural Maryland, where most projects have been licensed, are all-volunteer organizations whose Standard Operating Procedures (SOPs) may not address fireground operations at PV facilities. Because of this, PPRP includes a license condition in its recommendations to the Public Service Commission to ensure that emergency response protocols are in place in the unlikely event of a fire or other emergency at the site unless conditions attached to the permitting of utility-scale solar energy systems by the host county adequately address fire safety issues associated with the project. Joint Base Andrews Naval Air Facility Washington Joint Land Use Study. The Maryland-National Capital Park and Planning Commission, Prince George’s County Planning Department, Upper Marlboro, Maryland. December, 2009. Soil compaction is the physical consolidation of the soil that destroys structure, reduces porosity, limits water and air infiltration, and increases resistance to root penetration, usually resulting in reduced crop yield. Final Environmental Impact Statement. Volume 1. Department of Energy Loan Guarantee to Royal Bank of Scotland for Construction and Startup of the Topaz Solar Farm, San Luis Obispo County, California. U.S. Department of Energy. DOE/EIS-0458. August 2011. Alchemie 2013. Solar Facts and Advice. Alchemie Ltd. http://www.solar-facts-and-advice.com/monocrystalline.html. Accessed January 6, 2015. Kahe Utility-Scale Photovoltaic project. Draft Environmental Assessment. Prepared by Planning Solutions for Hawaiian Electric Company Inc. May 2014. Noise consists of vibrations in the air that gradually decrease, or attenuate, the farther they travel. For people who live or work near a power plant, the noise impacts, along with visual and traffic impacts, can be the most significant type of effect caused by the facility. Noise, measured in decibels (dB), is made up of many components of different frequency (pitch) and loudness. Three decibels is approximately the smallest change in sound intensity that can be detected by the human ear. The sensitivity of the human ear varies according to the frequency of sound; consequently, a weighted noise scale is typically used when discussing noise impacts on nearby communities. This A-weighted decibel (dBA) scale weights the various components of noise based on the response of the human ear. The ear perceives middle frequencies better than low or high frequencies; therefore, noise composed predominantly of the middle frequencies is assigned a higher loudness value on the dBA scale. The State of Maryland has adopted noise pollution standards, found in COMAR 26.02.03, which are derived from federal noise guidelines. The State regulations establish maximum allowable noise levels by zoning designation and time period (day vs. night). Compliance with noise standards is enforced at the county level, and some counties and municipalities in Maryland have more specific noise ordinances, including Montgomery County, Charles County, and Baltimore City. As sound waves radiate outward from a noise source, they lose intensity; thus, the sound decreases with distance. Ensuring adequate buffer distances is an effective method of controlling noise impacts. Structures such as berms and walls may also be constructed to provide noise control, and have been used in transportation applications for many years. Vegetative buffers may be used in conjunction with such structures for additional noise abatement. PPRP evaluates potential noise impacts as part of the CPCN licensing review for proposed power plants. All generating technologies have some type of noise emissions associated with them; even solar power emits a noticeable “electrical hum” from the inverters, but this is only audible at very short distances. In the past few years, noise impacts have been a particular concern during licensing cases for the Cove Point liquefaction project, and for the Keys and Mattawoman natural gas-fired plants, located in close proximity to each other in southern Prince George’s County. PPRP evaluated the potential for specific residences to be affected by noise from both of those facilities, and concluded that there was no significant cumulative effect.